"I write in the night. I get up at half past twelve. I go to bed at half past ten, and I get up at half past twelve. Then I finish my chanting, if there is any balance, and then I begin dictating. And the morning they take it and type it. So this dictaphone is always with me, wherever I go, so my writing book is not stopped. Maybe few pages, but something is there daily. Little drops of water wears the stone. So in that way we have translated so many books. About fifty-four books are already published, besides the small booklets. And, how many we have published, Bhagavatam? About twenty-two?" The above sign was posted in the pujari room, just below Srila Prabhupada’s quarters in Los Angeles temple, during Srila Prabhupada’s last visit in June 1976. It may have been written by Navadwipa dasa who was the head pujari at the time. 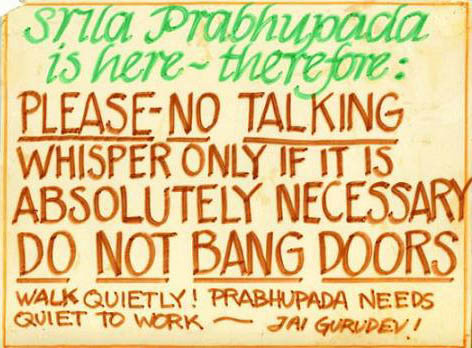 The sign reflects the mood when Srila Prabhupada was present at a temple; you had to be careful not to make noise so Srila Prabhupada could concentrate in his translation work. It is tadiyam because is related to Srila Prabhupada, and it still exists in my possession. "Your guru is writing books. 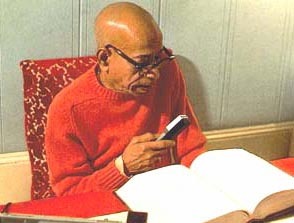 If you think, 'There is no necessity of reading books,' that is guror avajna. Do you means to say I am writing these books whole night for selling and making money? What do you think like that?"